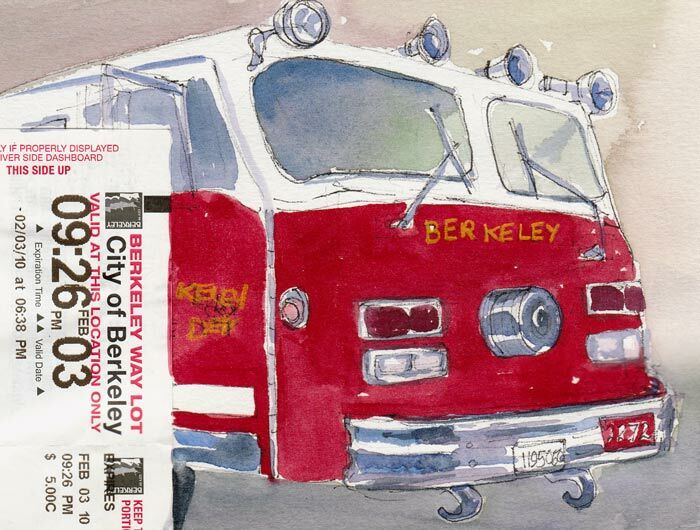 The Berkeley Fire Station #2 was the scene of our Tuesday night sketchcrawl two weeks ago. Cathy had requested permission for us to visit and sketch and they generously gave us access to the station, the vehicles and equipment. The firemen live at the firehouse during their long shifts and since it was a quiet night they came around to see what we were doing. They all told us how much they love their jobs and were extremely helpful, earnestly answering all of our questions. We loved seeing the boots and overalls, ready to jump into, by the doors of each truck (above). I know the requirements are very stringent for becoming a firefighter, but do they also have to qualify as centerfold models? These guys were simply gorgeous: tall, strong, handsome, and really nice too. (If only they would have posed for us!) Firefighters have one of the highest rates of job satisfaction of all careers. This little Tiller Truck caboose steers the back of the fire truck while the steering wheel at the front steers the front wheels. We learned that a Fire Truck is “a big tool box” where they keep all their gear such as Jaws of Life and the Fire Engine carries the water and hoses. I held off posting these sketches because I’d been really frustrated with the messy, helter-skelter way I laid them out in my sketchbook and the ones not posted that were just ugly (but which I made good use of, writing my notes to self for improvement on top of them). When I looked at Cathy’s sketches I really liked the way she approached the subjects and designed her pages. That set me off on a learning process that I will write about next time when I post her sketches from the evening. Touching salute to NY colleagues. And good sketches, Jana. There is no one I admire more than a fire fighter. Thanks for your tribute and great sketches–they sure look great to me. Looking forward to Part II. Fire fighters in Britain tend to be hunky, too. I guess the physique goes with the job, and perhaps the job satisfaction contributes the general air of being comfortable in their skin, and the big smiles… Same thing goes for lifeboatmen, and most of them are volunteers (in this country at least), so it can’t be the pay! I have nothing but admiration for people whose work is risking their life to save others. 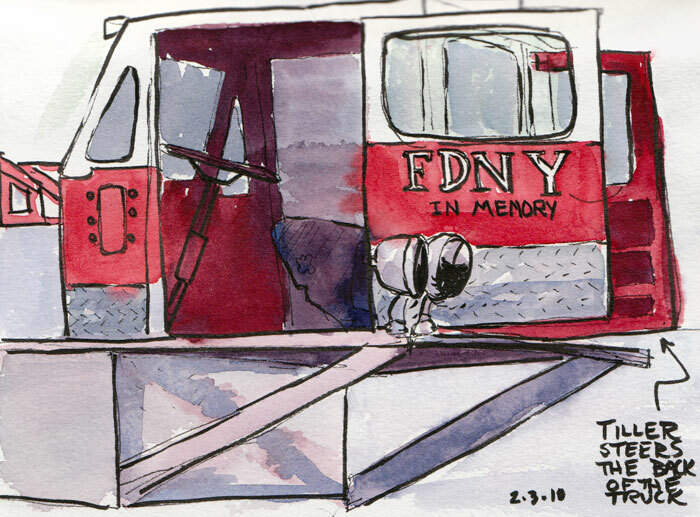 Love the fire truck sketch! You go sketching every Tuesday? I’d like that. My local painting group sticks to watercolor, and is fairly dedicated to eating and socializing – neither of which is bad, except when it takes time from painting. 🙂 One of my “bucket list” items is to slide down a fire pole. Did your firehouse have one? Back when I was in elementary school my class visited a firehouse and we were given the change to slide down the pole, but I said no because in those days we were required to wear dresses, and I thought everyone would see my underwear. No problems with wearing dresses these days! I’m loving your posts lately and look forward to seeing your friend’s well-designed pages. Great sketches! I am very impressed. 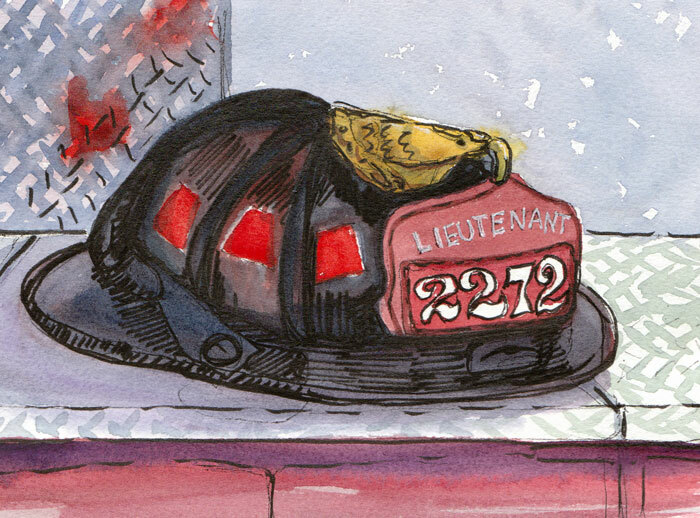 How long were you at the Firehouse sketching? That sounds like a really fun sketch date. Love the boots and coverralls just waiting to go. Wonderful post. You are amazing. Any more specifics on your classes? I will be reading in the Spring. 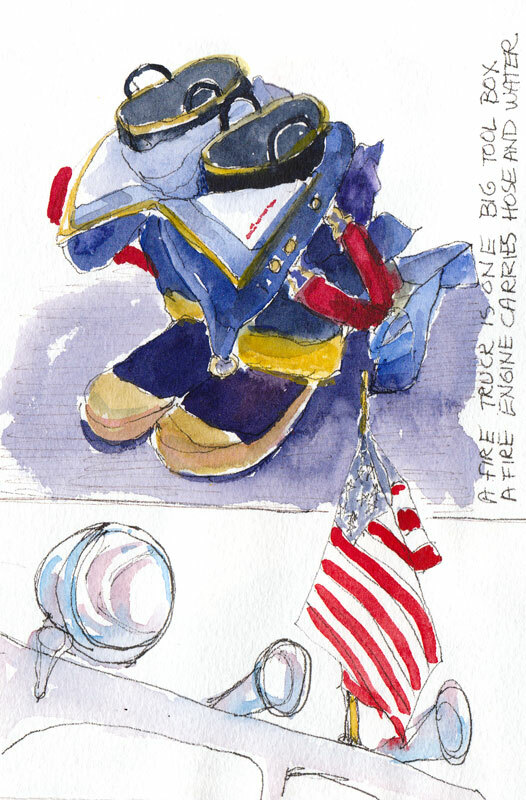 Going over to Bodega Bay for a retreat and hope I can start a sketching journal. You are such an inspiration. Thanks Jana! I’m excited to hear about your sketching journal. Let me know if you need any suggestions for getting started. I can also recommend several inspiring books if that would help. What a great place to sketch!! Did they have any problems getting you all to leave? I don’t think I would have gotten anything done being surrounding by attractive men! These are wonderful. I love your reds! Nice set of sketches! That’s a great location for a sketchcrawl, too. Did you do all your watercolor there, too, or finish up at home, or take pictures for reference? Always wondered how such nice sketches are done on a crawl.